A sublime spoof set in contemporary Japan. 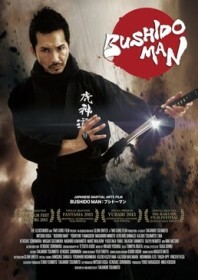 A wandering fighter in Samurai attire returns to his sensai after a year’s traveling to challenge a succession of martial arts masters. He is a diligent pupil of the Cosmic Way, told by his food-obsessed teacher that in order to truly understand his adversary, he must first eat like them. So he stuffs his face with Chinese dumplings before squaring off to a young mantis style kung fu master, and tucks into steak before facing the bullets of an American-themed gunslinger. The film is a glorious farce played brilliantly deadpan by lead Mitsuki Koga. It gets really silly when the bullet punching appears, before a servant’s arm is torn off and used as nunchakus. But the fight scenes remain a vision of meticulous authenticity, extended into great poetic motion by choreographer Kensuke Sonomura. The false ending is laugh out loud funny, just make sure you stay for the full finale.